I go through this cleansing ritual of weeding things out from my closet relatively often but, I only end up taking out a few pieces from the rotation. As you can probably tell from my blog, my style can change daily but, I tend to stay true to an eclectic and "casual chic" vibe. This outfit has truly been a go-to for me on days where I just don't feel inspired by any of my clothing. Denim (distressed or not) - check. Comfortable shoe option - check. Sometimes, simple is really the best. That bag is fabulous! I have to admit that I hate birkenstocks, but you seriously rocked them out in this outfit. I can't say anyone else has done that in blogland! So chic... love this jacket! 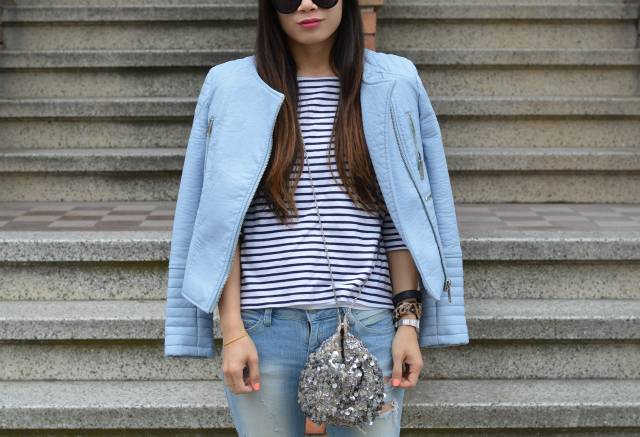 Love the powder blue jacket with the stripes! Perfect go-to outfit! Pretty look, love the jeans and, especially, love that jacket! Gorgeous pastel blue! I think we all have certain pieces that are fail safes that we can just grab out of our closets without even thininking. Cute jacket! Ooooo loving the blue on blue on blue look! I tried that jacket on in Zara it is gorj! Love the different hues of blue! And yes I agree with you, at the end of the day..those basics will always be chic and timeless! I love the blue palette of this look! And the birks! love the top, stripey top is the best! It is amazing how that little bag goes with everything. Nancy, Love the uber chic outfit, it is so well done and weekend ready! Love the Birks and the flash of bling from that darling bag. That is one stunningly stylish casual outfit! the bag is a gorgeous addition. It wouldn't be as awesome without a glittery bag. You rocked this outfit! I love your leather jacket Nancy! It looks so good with that striped tee! Great bag! This jacket is the perfect mix of feminine with edge. I am horrible at weeding out my closet. I just don't know how to let go. You look amazing! Love the jacket, so happy to have discovered your blog, thank you for your comment on mine. I love the addition of the sparkly bag! It's pretty and adds a bit of bling to your outfit.